I've been having such a great time with my bead soup and checking out all the other blogs. Really, it's been a blast. Now has come the day when we reveal our finished pieces. I've been really looking forward to this day, so much that I made my blog post early and am publishing it now. Cool. This way I can work on the post and edit it over the next few days. So Sassy wonderful!! Great job. Lovely work, Heather! Thanks for sharing your bead soup entree! Love the colors, an excellent piece! Wow! I am so drawn to these colors! They are ME! I scrolled through your blog to see the beautiful beads your partner sent you -what amazing beads! I love the dangles in the front, and I LOVE what you have created! Fabulous! Can't wait to see what your partner made! I love the dangle too - lovely work! Wonderful! You have created a terrific piece of wearable art. I like your use of color and texture and the great asymmetrical placement of the focal bead. Thank you for sharing your artistic process along the way. Cheers! I am SO sorry for being late -- today our internet provider decided to crash. My stress level is through the roof, to say the least! WOW but this is my kind of jewelry. I'd wear this in a heartbeat. 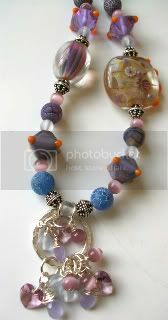 I love the texture and the lampwork is divine and the dangles (you know how much I love dangles). I'm so glad your beads got to you ALL the way to Perth, and I hope you participate again! Very nice! Like everyone else, i love the dangles. Beautiful! I love the focal and design of your piece! Very pretty, and I like how you created the focal area, with all the danglies! That turned out so pretty. I love all the little dangles from the focal. And the colors are great. Wonderful color combination! Loved how you accented the purple with the orange. It brings the necklace to life! Thanks for visiting my blog and your sweet comments! Oh so pretty! I love the colors. I would not have imagined that violet and orange would go so well together, but you really made it work beautifully! Fantastic job, the necklace is a stand out! I love the colors, love the artists beads. I would imagine you would get lots of nice comments wearing this. You created such a lovely, cheerful necklace! What fun! Really beautiful necklace. I love the design and the colours. 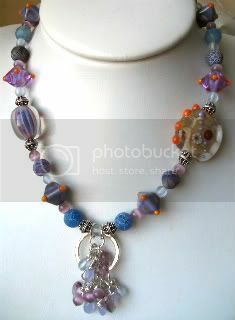 Creative stuff, I particularly like how you created a pendant out of tiny beads and used the focals as accent beads. 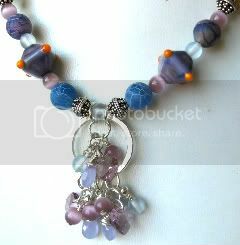 So pretty - I love the colors and how you dangled the beads in the center! Everywhere I look there is something beautiful to see. Love all the wonderful colors! Nice job. Here it is after 6:00P.M. on Monday and I am only 1/3 the way thru the list. What a fun and beautiful piece. It's great! I really like what you did with the focal and those colors are just dreamy. Beautiful necklace - love the dangles on your focal!! Wow! What a striking piece! Wonderful!! Very pretty - the cluster of little drops is so fun! Oooo purty! What a pretty necklace! So soft and feminine - lovely work! Great necklace from your soup ingredients. Pretty shades of lavender and blue with pops of orange. Beautifully designed. You did a Soup-er job with your ingredients! This is lovely, Heather! I love your soup (especially those beads with the red dots -- an added zing!). You put them all together beautifully. I could totally wear this necklace! What fun colors! I love it! You rose to the challenge magnificently. Lovely design, and nicely done! Lovely necklace! 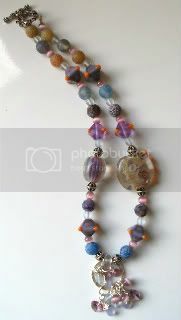 I like the soft colours and think you've got a nice blend of beads in your design. Great job! Lovely piece with a great color composition - great job, love it. Very pretty...love the ring and the dangles up front. Great necklace, love the focal cluster you made too..
Love the jumble of colors on your focal ring!! Nice job! Still making the rounds and tasting all the soups! Really like the asymetric look. Lovely. Love the colours - purple and blue are so calming! The bunch of dangles at the front make a great focal. Bold and beautiful! Love those colors and all the elements that came together! Awesome work!! !